Seizures are common in pediatric age group and occur in approximately 10% of children. The occurrence of a single unprovoked seizure in childhood deserves careful consideration. The present study was undertaken to evaluate the risk of seizure recurrence and associated risk factors after a first unprovoked seizure (FUS) in Indian children after12 months. This prospective observational study was carried out at a tertiary care teaching institute during the period of May 2007 to February 2010. Patients between age group of 1month to12 years of age with FUS were included. Patients with and without antiepileptic drug (AED) were included in the study. All children were prospectively followed for a minimum of 12 months. There were 40 children, 25 males, 8 (45.0%) were below 5 years. Five had significant birth history and two of them had developmental delay. Six (15.0%) patients had past history of febrile seizures, 3 (7.5%) had abnormal central nervous system (CNS) examination. Twenty nine (72.5%) patients had generalized convulsion, out of which 4 (10.0%) presented in cluster. Eleven (27.5%) had focal convulsion, 3 (7.5%) had simple partial and 8 (20.0%) had complex partial seizures. 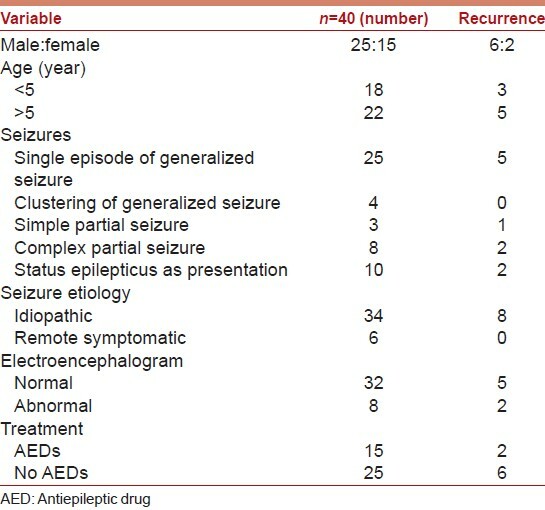 Eight (20%) presented as status epileptics (SE). Eight (20%) patients had abnormal electroencephalogram (EEG). In all eleven patients with focal seizures computerized tomography (CT) head was normal. AEDs were started in15 (37.5%) patients. Eight (20%) had recurrence within 12 month of FUS. Five of 29 patients with generalized seizures and 2 out of 10 SE patients had recurrence. Those who presented with clustering of seizures had no recurrence. 3/8 patients with abnormal EEG, 2/15 patients on AED and 6/25 without AED, had recurrence [Table 1]. There should be no haste in starting AED following a FUS considering the side effects of AEDs, particularly subtle cognitive and behavioral side effects. Neurological examination was normal in 92.5% patients as in the study by Hui et al. 37.5% children with abnormal EEG had recurrence compared to 45% children and 20% patients who presented with SE had recurrence compared with 50% in the study by Shinnar et al. 13.3% on AED had recurrence as compared to 6 (24.0%) out of 25 patients without AED compared to 54.8% and 45.3%, respectively in other study. Our study suggests that, risk of recurrence after "FUS" is less despite of age of presentation, type of seizure, presentation as status epilepticus, treatment with or without anticonvulsants. So anticonvulsants need not be started after "FUS." 1. Hauser WA, Anderson VE, Loewenson RB, McRoberts SM. Seizure recurrence after a first unprovoked seizure. N Engl J Med 1982;307:522-8. 2. Hui AC, Tang A, Wong KS, Mok V, Kay R. Recurrence after a first untreated seizure in the Hong Kong Chinese population. Epilepsia 2001;42:94-7. 3. Shinnar S, Berg AT, Moshe SL, O'Dell C, Alemany M, Newstein D, et al. The risk of seizure recurrence after a first unprovoked afebrile seizure in childhood: An extended follow-up. Pediatrics 1996;98:216-25. 4. Camfield PR, Camfield CS, Dooley JM, Tibbles JA, Fung T, Garner B. Epilepsy after a first unprovoked seizure in childhood. Neurology 1985;35:1657-60.